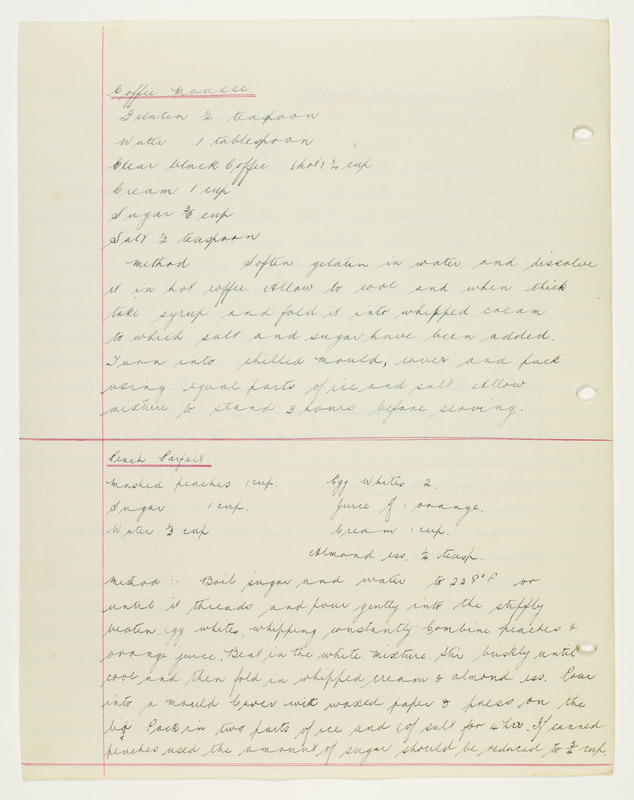 In our last ‘Stirring up the Stacks’ post, my colleague Kari laid down a challenge: find old recipes in the collections, try them out, and inflict them on fellow staff members for their verdict. The recipe I found comes not from a publication or manuscript, but from a glass plate negative (reproduced above), noticed when rehousing records of the University of Otago’s former Home Science School. It dates from the 1930s. Four instructors in uniform stand in front of a group of fifteen women. 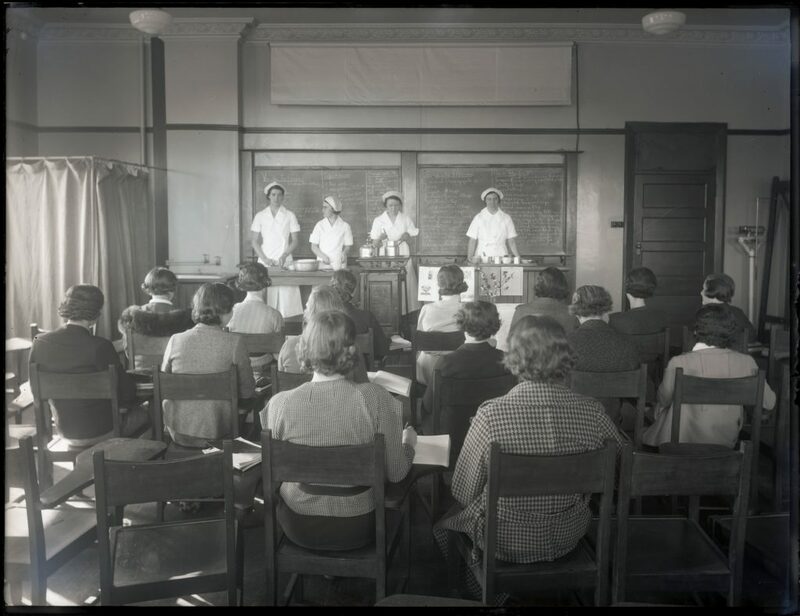 These women don’t appear to be students, and possibly the class was one of the demonstrations given through the Home Science Extension Bureau, or one of the ‘refresher’ courses offered to former students. 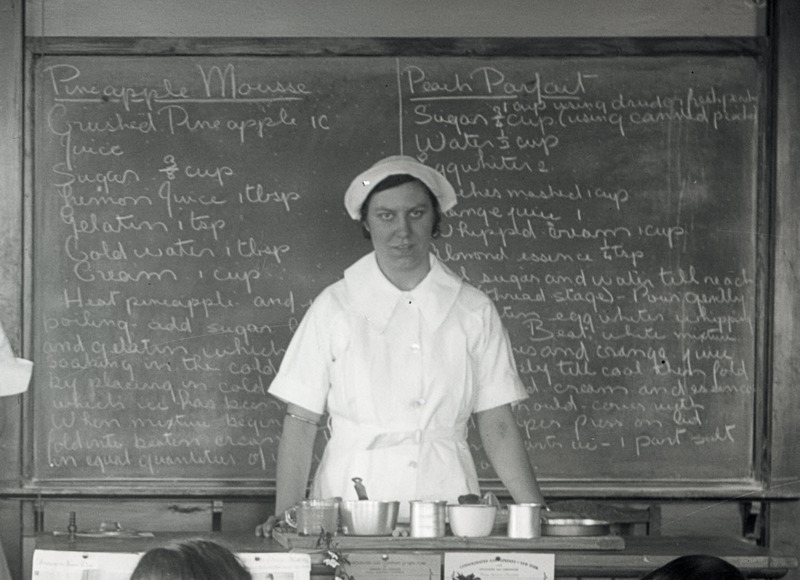 Behind the instructors, written in chalk on the blackboard, are five recipes. One of the great thing about glass plates is the level of detail that can often be found in them – you can really zoom in! Richard, our reprographics wizard, scanned the plate and was able to pull up the recipes with some clarity. The titles were clearly visible: vanilla ice cream, coffee mousse, orange water ice, pineapple mousse, and peach parfait. Most of the text for the last two recipes is readable, partially obscured by an instructor staring down the camera. Method: Boil sugar and water to 238˚F or until it threads and pour gently into the stiffly beaten egg whites, whipping constantly. Combine peaches and orange juice. Beat in the white mixture. Stir briskly until cool and then fold in whipped cream and almond ess. 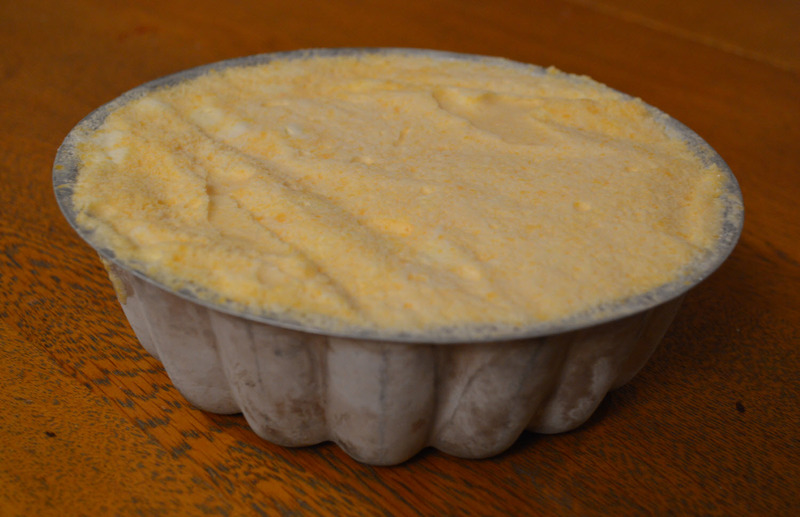 Pour into a mould cover with waxed paper and press on the lid. Pack in two parts of ice and 1 of salt for 4 hrs. 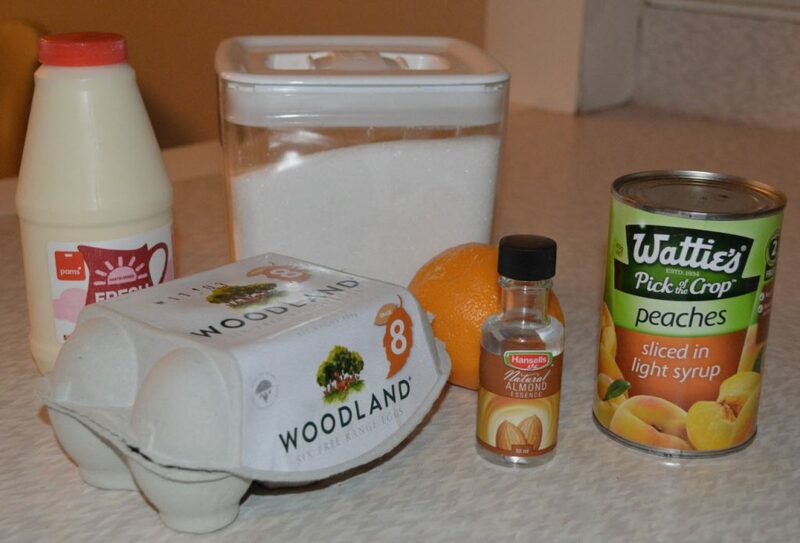 If canned peaches used the amount of sugar should be reduced to ¾ cup. My prior knowledge of frozen parfaits was somewhere between non-existent and negligible, but this is apparently a fairly conventional recipe, except it only uses the egg whites and not the yolks. The most unusual ingredient is the almond essence, and I was not entirely convinced it would go with peaches, but looked forward to finding out. The cooking process was fairly straightforward. I did use tinned peaches, and so used less sugar as directed. I wasn’t quite sure how mashed they should be, but erred on the side of a smoother consistency. The trickiest bit for me, not having a thermometer, was boiling the sugar and water to the correct ‘threading’ stage. To add to the fun I found a vintage (though not 1930s) mould. Unwilling to experiment with packing in ice (apologies to those wanting closer authenticity), I covered the finished mixture tightly in its mould and put it in the freezer overnight. Turning the parfait out of its mould was a bit tricky, but dipping it in a bath of warm water did the trick. 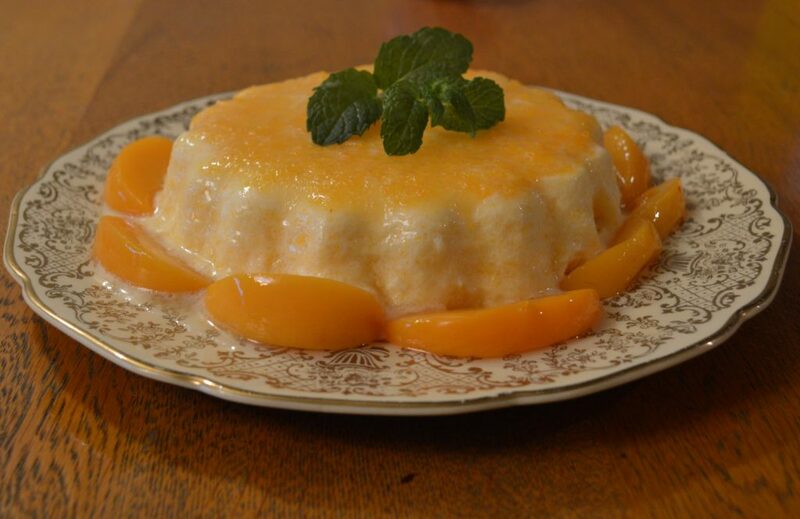 I tarted it up with some more peaches and a sprig of mint and hoped it would pass muster. Overall, it turned out better than I expected, and I would make it again. It was fun to bring to life the obscure detail of an image in the collections. Glass plate negative showing cookery class. University of Otago School of Consumer and Applied Sciences records. Hocken Collections – Uare Taoka o Hākena. MS-1517-034-005. Page from Rae Vernon’s Foods 1 practical workbook. Association of the Home Science Alumnae of New Zealand records. Hocken Collections – Uare Taoka o Hākena. MS-1516/023. The former parking area has been shifted into Parry Street (access via Minerva Street). There is a sign indicating the parking for Hocken patrons. A walkway from the carpark to Hocken is under construction. Parking is also available towards the University campus in Albany Street, Forth Street and Reigo Street. During University term time, parking may be more difficult to locate. If you wish to drop off material for the Hocken’s collections, please ring 479 8868 and we will advise the best route to take to our loading bay. There is a drop off bay located outside the front entrance to the Hocken, at the intersection of Parry Street and Anzac Avenue. Note that you can’t park here but visitors may be safely dropped off out of the Anzac Avenue traffic stream. We expect there to be considerable disruption until at least the middle of 2011. There is significant road work commencing in Anzac Avenue and Parry Street as of today which will result in the permanent closure of part of Parry Street adjacent to the Hocken Library building and the realignment of State Highway 88 to Port Chalmers. Barriers have gone up today closing this part of the street to vehicular traffic and as I am writing the road is being dug up! If you are on foot, we advise approaching the building only from the Anzac Avenue side currently. PLEASE watch out for heavy machinery and take care to observe all signage erected by the contractors. There is still plenty of parking available in the rest of Parry Street, which can be accessed from Minerva Street alongside the Leith Stream. There is also an area of Hocken visitor and staff parking set aside just off Parry Street. Please feel welcome to use this. To get from Parry Street to Anzac Ave (and vice versa) for safety’s sake please don’t walk through the closed part of Parry Street currently. There is a footpath along the north eastern side of the Unipol Building (the gym next door to the Hocken) which is safe to use to move between the two streets. This work is planned to take about 6 months and we expect that access to the Hocken building from the Parry Street side will be difficult or unavailable at times. Access on foot from Anzac Avenue will be always available. We will try to keep you posted but the situation will be changing day by day. If you have mobility issues and want to visit the Hocken please contact us for advice on the day.